Ironband | Run Chicago for CF – We’re Back! Run Chicago for CF – We’re Back! We’re back! 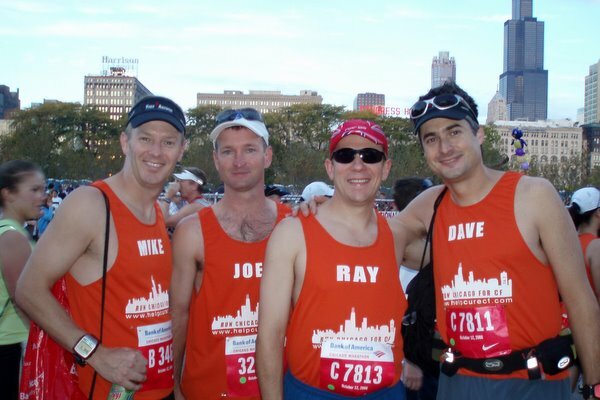 Joel, Ray, Mike, and I all knocked out successful finishes of the Bank of America Chicago Marathon on Sunday. And with your generous help we successfully raised over $3200 for the Cystic Fibrosis Foundation! We also set a couple of PRs and saw Mike, who turns 40 today, cross the finish line and qualify for the Boston Marathon by a mere 17 seconds – how’s that for a dramatic finish? Congratulations to Mike on reaching his “before I turn 40″ quest! Despite relatively warm temperatures and a few injuries and training issues everyone managed to cross the finish line in once piece (only one face plant – MIKE) and despite being a little worse for the wear, everyone is doing well and happy with their efforts. I didn’t hit my original goal of finishing in 3:30, but considering the knee issues and relative lack of training over the past few weeks I’m very happy with my 3:45 which is, after all, eight minutes faster than my previous marathon personal record so I’m chalking it up as a major success. Congrats to our other friends on their strong efforts who were also in the windy city running – Steve, Anita, Sherri, Janet, Suzi, and Trish. This year’s edition of the Chicago Marathon saw 45,000 people registered for the race, 33,033 people start the race, and 31,401 people finish the race. Kenya’s Evans Cheruiyot took the $140,000 top prize with a staggering 2:06:25 finish and on the women’s side Russia’s Lidiya Grigoryeva took top honors with an equally astounding 2:27:17 finish. The course, organization, volunteers, and spectators were absolutely incredible. Check-in was a breeze, the expo was top notch, and the aid stations, which seemed to go on for two blocks each, were stocked with Gatorade and water. The fans were incredible – most of the 26.2 mile course was flanked by spectators that were multiple rows deep and even the sparsest of stretches still had spectators every few feet. We ran through so many different neighborhoods and parts of the city that I feel like I had one of the best tours of the city that I’ve had in my 20+ years of visiting Chicago. Kudos to our family, friends, and “fans” – Carolyn and her “Don’t make me get the spatula” sign (and her willingness to watch me torture myself yet again), my sisters-in-law Emily and Lindsay, Julie, Craig and his girls, Tim, and everyone else out there cheering us on and helping us keep going all the way to the finish line – you guys were awesome! Our thanks go out to everyone who helped with this effort. Your generous contributions are greatly appreciated and will go a long way toward helping the Cystic Fibrosis Foundation reach their goals. It was rewarding to help Joel in his effort to raise money for the CFF and we wish Joel and Kristin and their children the best and look forward to doing this again in the future.